If you missed the previous story, I invite you to read it Packing? What Packing?! Sitting at the kitchen counter, on a stool, staring out the window on a winters day... *dreaming* ... which in my head means to determine where will I venture to and how will I get there (goal making). ;) "If I move to Spain ... when I move to Spain... that will make "Europe", in all of its entirety, very close"...wheels in my head start turning. If I am in Spain then I could visit Ireland, Holland, Germany, France and maybe one other place in the Middle East or near India or Asia or ? A travelers heart never rests ... "must have a countdown". So, long before the passport application, I had an itinerary, or at least an 'idea' of where I'd like to visit once in Europe. One day in early 2013, I took out a pen and paper and sketched 'the plan'. This plan involved festivals or events that one reads about and thinks "one day I'd like to go there just for that". On that list was Oktoberfest, St Patrick's Day, Valentine's Day, Christmas/New Years and a Tulip Festival and each followed by a country and a city to match the annual dates. If I could figure out the timeline, then I could visit Munich during the 2013 Oktoberfest etc etc. A 16 day festival, referred to as, "the beer drinkers Mecca". Imagine 14 tents (tents that are actually large roofed buildings), filled with people from all over the world, laughter, singing and dancing. A place where 10 Euros gets you a mug of beer, and due to rules of what can be served during Oktoberfest, you know that it's at least 6% alcohol per volume (as sited by Wikipedia). Plus food, delicious German food, available upon request and all the carnival rides and games, to which no one would have time in one single day to test them all. Where do you even start? There's 42 acres of activity there...all you need to remember is to get out of the metro at Therienwiese stop. So I found my seat sale and purchased a one way ticket for Munich Germany. Oktoberfest here I come! :) As the date for departure drew near, two of my girlfriends made vacation plans to join me for the first two weeks. First stop ... Germany. About 3 weeks before departure the girls asked me where we'd be staying ... *pause* ... "staying? ... I haven't had time to book anything yet" LOL So without further ado, I began the search. Apparently waiting last minute to find a place to lay your head at one of the largest events in the world, proves not only lacking choice in proximity, but also a little hefty on the wallet. With some intense searching, our place had been found: Garden House alltherooms.com in the Trudering area of Munich. I was happy to find a place that would accommodate three of us in one room and within a subway ride to "the" event. It seemed perfect online, but wait till I tell you what happened upon arrival (it got better, WAY better and way more perfect). Then came the booking of flights. Maybe some of you can relate to this ...since my ticket had been purchased forever before, Connie and Stephanie needed to have theirs. Of course, due to availability and location, we were unable to schedule the same flight. The plan then became, trying to find flights that would arrive at the airport within relatively close proximity of time, but all flights needed to arrive at the very least, on the same day. BAM! Within a few days, everything worked out. First, I would arrive, then Connie and finally Stephanie. Luggage. Dear Luggage...or Damn Luggage? ;) Limited to bring on this international flight; only 2 suitcases, one carry-on and a personal handbag, I somehow managed to pack for this 8 month adventure within the weight restrictions (only 23 kg per bag) ... impressive, especially if you've ever witnessed my packing for a weekend or a one week vacation! I am historically the "Queen of over packing" haha. Two things to be thankful for: (1) WiFi at airports (which in Munich is only available for free for the first 30 minutes...tricky if you're trying to connect with your friends who will arrive about 60 minutes between flights lol) and (2) McDonalds (those golden arches are international symbols that are so recognizable, you can say 'let's meet at McD's' and friends know where to go). I met Connie at her gate, she then logged into WiFi and messaged Stephanie. We weren't sure which terminal she'd be landing in, so just stated that either terminal she arrived in, just to walk toward the other one lol. Between Terminal 1 and 2 you could spot the golden arches, nearly 1/2 way between the two in the courtyard. By 2:30 pm Connie was hugging Stephanie for the first time (never had they met before) and I was in my glory having arrived in Germany with two of my awesome girlfriends. ~life is good~ WE HAVE ARRIVED!! Late afternoon now, I think it's time we take a little pause in our adventures for today. There's a large list of incredible things to experience in Munich (well before we get to Oktoberfest). 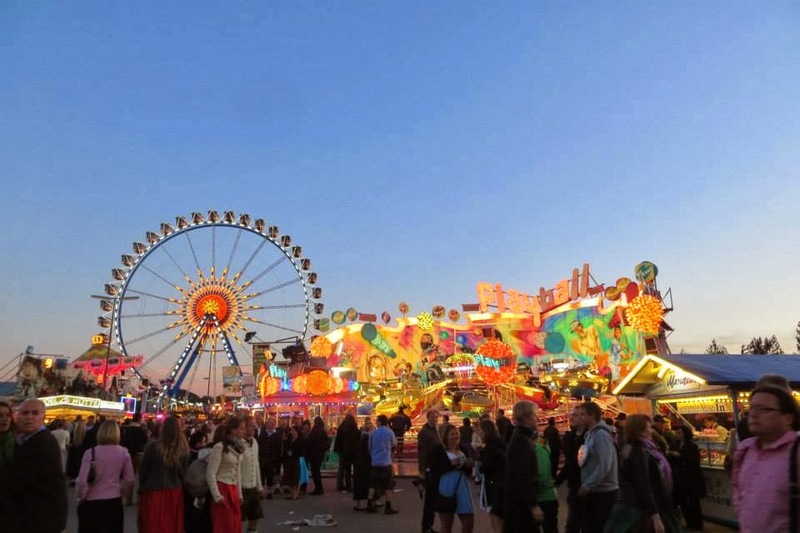 In the next installment of First, Let's Go To Germany 2013, entitled Willkommen in München ~ Welcome to Munich we'll leave the airport, get settled into our amazing accommodations, visit areas like Allianz Arena, Marienplatz, Englische Garten etc. Loved this blog!!!!!!!!!!! I wanted to read MORE - I can't wait for the next blog!! !